'Five Doors North' is a popular North Toronto restaurant, and apparently they have a new sign. I'm on Jury duty this week! Which means no going to work (between 9 and 5, anyway), and spending lots of time downtown. So far it has been mostly waiting around; I see why there hasn't been a TV drama called "The Jury Pool Chronicles". 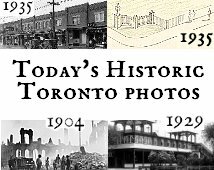 Expect some pictures of Old City hall, University Avenue, maybe even a person-picture or two.